The Wisconsin supreme court recently artfully danced around a few thorny policy issues when it released its long-awaited decision in LeMere v. LeMere, 2003 WI 67. The case presented the opportunity for the high court to rule on the relative weight which trial courts should give in property division cases to the relative quality and quantity of the roles performed by each party during the marriage. The resulting decision, while taking no absolute position and containing enough language to give both sides ammunition for argument, gives the trial court a certain amount of guidance, while not invading the trial court’s discretion. During the marriage, Michael LeMere, while employed as a firefighter, began operating a side business of fitness centers. The business was so successful, he eventually left the fire department and worked long hours developing the business. At the same time, the wife was apparently the primary homemaker for the parties’ two children. While the trial court, Judge Mark Warpinski from Brown County, divided the rest of the marital estate equally, he used Parrett v. Parrett, 146 Wis. 2d 830, 843-45, 432 N.W.2d 664 (Ct. App. 1988) to support a finding that the valuable business should be divided 65/35 in favor of the husband. The court of appeals, in an unpublished decision, affirmed. In two previous columns following the granting of review by the supreme court, I expressed the view that this case had the potential to have significant impact on the future of family law (many thanks to Justice Bradley for reading from my article during oral arguments). 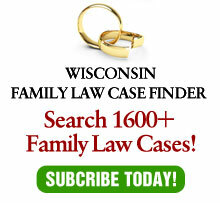 See: Gregg Herman “Case Review Could Touch On Homemakers’ Contributions,” Wisconsin Law Journal, Jan. 22, 2003. I wrote that if the high court upheld the trial court, it could be assumed that Parrett would be cited frequently as most parties to a marriage typically believe that they do more work than the other. On the other hand, if Parrett was reversed, it might reduce litigation by determining once and for all that trial courts cannot engage in a “who did more” test in dividing property. Instead, the supreme court did neither. The decision leaves the question unanswered. While the supreme court reversed Judge Warpinski’s order, it did so essentially as an error-finding court, rather than making any new policy. Specifically, Justice Diane S. Sykes’ opinion held that the trial court erred by premising its decision solely on one factor, Wis. Stat. §767.255(3)(d), or the respective contributions to the marriage. Then, the court held that a trial court may give one factor greater weight than another or conclude that some factors are not applicable at all. The court did not give a minimum number of factors which have to be considered, but apparently it is more than one. The supreme court distinguished Parrett, finding that it involved a short-term marriage, an absence of any contribution by the wife and “generous” child support and maintenance orders among other differences. The supreme court further noted that Parrett was decided under a previous version of the property division statute. Still, the court did not overrule Parrett or indicate that it was not a viable precedent. The result of the decision is to provide plenty of language to fuel the fire for both sides. As stated above, since Parrett was not overruled, it can be expected to continue to be cited for the proposition that the court can deviate from equal division of the marital estate due to the unequal efforts of the parties into creating the marital estate. At the same time, the trial court apparently cannot rely only upon the contribution factor in making its order. The court took pains to remind trial courts that marital efforts in running a business are not to be considered more valuable than marital efforts in raising children. As the court noted, carrying out the homemaking enables the other spouse to “focus more intensively on the business.” 2003 WI 67, ¶28. Still, it is important to note that the supreme court in its remand did not direct Judge Warpinski to order an equal division of the marital estate. Rather, it ordered him to reconsider the division of estate by considering other applicable statutory factors. Significantly, the court ordered that Judge Warpinski reconsider in a manner which does not “eviscerate[s] the legislative purpose to place child-rearing and homemaking on an equal footing with income-earning…” 2003 WI 67, ¶29. As the high court was no doubt aware, fact situations in family law cases can vary dramatically from case to case. For example, a wife who raises children contributes very differently to a marriage than one who does not. By reversing with directions, but allowing the trial court discretion, the supreme court allowed different facts to be decided differently in different cases without allowing homemakers to be divested of value for their contributions to the martial enterprise.